Denver’s green roof ordinance, passed in November 2017 and effective January 1, 2018 may not result in many new green roofs in the city and county. After much research and discussion, the Green Roofs Review Task Force made recommendations to a Special Issues Committee on Thursday, October 11. Those recommendations include alternatives to installing a green roof on new buildings or buildings that meet the criteria for the green roof ordinance. In developing the pathways, the task force agreed that the purpose of the ordinance is to help the City of Denver reach its sustainability goals and reduce the heat island effect. 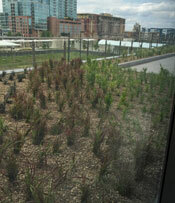 The updated compliance methods would address this goal despite allowing buildings to forgo installing a green roof. In updating the ordinance, the task force was concerned that owners of existing buildings might avoid or delay necessary repairs or renovations in order to avoid the cost of compliance with the green building initiative. There was also concern that new building developers may choose to build outside the City of Denver for the same reason. At the October 11 meeting, the Special Issues Committee learned that to date in 2018, three existing buildings have applied for roof replacement permits with the city. Each of those buildings qualified for an exemption based on a structural engineering analysis, which determined that the buildings could not support the weight of a green roof. By comparison, in 2017 more than 600 roof replacement permits were issued. The Special Issues Committee approved the task force recommendations and filed for approval with City Council. City Council approved the filing, and as a result, a public hearing and vote by City Council will be held on Monday, October 29, 2018. Read more about the green roof ordinance. Watch the task force present its recommendations to the Special Issues Committee.